President of CarecoTV, Host of Yamaha’s Whitetail Diaries, Cabela’s Fisherman’s Handbook and Americana Outdoors. (August 11th, 2016) – San Antonio, TX- I often wonder what the birds, squirrels, and other critters in the woods think of me as I wander around, squat down, wander around some more, squat down even more, then do it all over again. I, almost, can hear the squirrels talking about me and saying, “what a crazy human”. Of course, I think the same thing about squirrels when they chase each other around, they just don’t know it. Little do the critters know, I’m looking for the perfect tree. I’m looking for the absolute perfect spot for a deer stand or scouting camera. Over the years I’ve installed so many scouting cameras, at my age, it’s a wonder I can still find them. I’ve installed cameras in so many places that it’s impossible to count. I’ve had some success installing cameras and some total failures. I’ve used bailing wire, fabric straps, post mounts and many more. Some have worked and, frankly, some haven’t. When they do work the pictures we capture are awesome. I’ve tried many mounts you just push into the ground, but with high winds, poor soils, or critters, they tend to knock over a day or two after setup. Recently, however, I’ve found that the Do-All Outdoors Dead Deer Ground Auger Camera mount to be the easiest and most successful way to mount my scouting cameras. 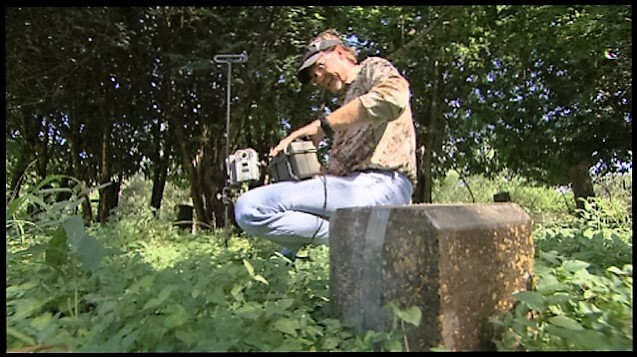 The solid steel ground auger camera mount features a built in handle and 3/8” solid steel design. Simply twisting the auger into the ground within seconds makes for less headaches and better pictures. I can now mount a camera, confidently, just about anywhere except in solid rock. 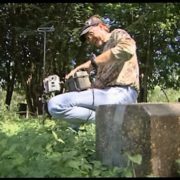 The Do-All Outdoors Ground Auger allows me to securely place a scouting camera anywhere I want without having to rely on trees or fence posts. I, also, get every angle covered so I never miss a deer cruising the area. A simple thumb screw on the camera mounting bracket allows for various height adjustments while solidly locking the camera into place. With this mount I can really cover all those places I want to at anytime. Guess those pesky squirrels will have to find someone else to entertain them now that I no longer have to look for trees to mount my camera.